Getting notified by email for call events can be a very powerful tool for teams and people on the go. To create a new notification, go to Settings and then to the Notifications tab where you'll see all existing notifications and a form to create a new one. You have a few options when setting up call email notifications. 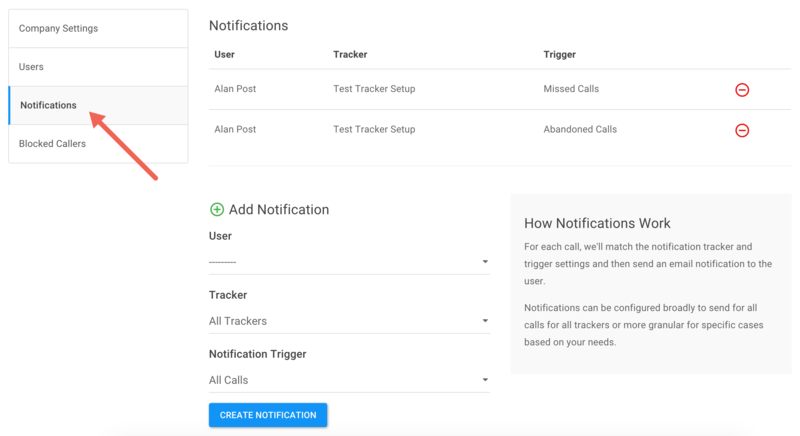 You can choose to get notified for specific trackers or all trackers. You can also choose what type of call event criteria to meet, such as only getting notified for missed calls. Note Only users can get call notifications, if you have a team email such as sales@yourcompany.com, you can create a new user account for this email and subscribe it to call notifications.